★【Cinnamon pumpkin】Extracted from Sweet butter and strong Cinnamon, blend of wild pumpkin and clove, the fragrant interpretation is underscored by vanilla and caramel. ★【Cedarwood fir】Fresh lemon mixed with cardamom make you relax, pine,fir balsam and firneedle spices share warm and piece is infused with Christmas, a base of cedarwood, musk patchouli and vanilla recollect the pleasant flavour of Christmas tree. 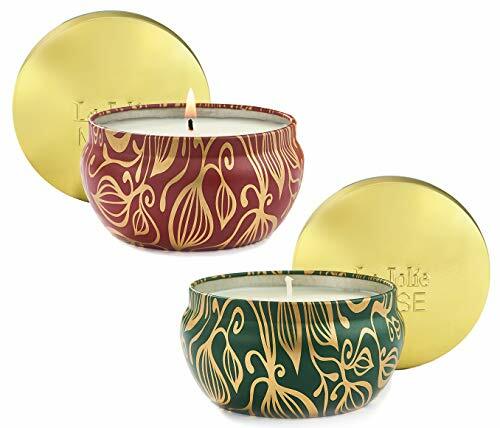 ★【Why you buy it】La Jolie Muse candles are made with a premium, soft, highly refined, natural wax and fragrance to optimize burn and fragrance diffusion. ★【100% Satisfaction】- We provide full refunds & returns if there's any problem after receiving the product.